Call 909-337-2341 to sign up for a private or group tour. 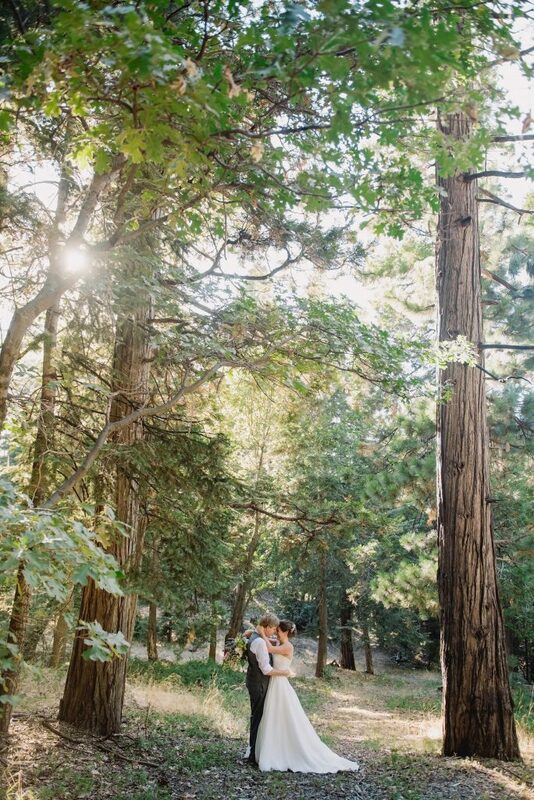 Experience A Forest Wedding, at Hidden Creek Lodge, our one-of-a-kind outdoor rustic wedding venue with a picturesque forest backdrop. 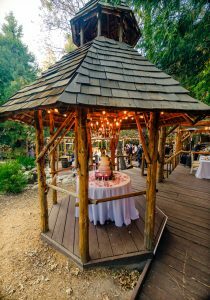 Imagine your ceremony in a custom log and branch gazebo situated within a multi-tiered wooden amphitheater (so all your guests have a good view), nestled in pine trees overlooking a lovely pond. Celebrate, with family and friends dining in a woodsy trellised reception area light with market lights. Also, you have a darling a cake-sweetheart gazebo just for cutting the cake (or dessert). Dance under twinkling cascading lights and stars near babbling mountain streams. Enjoy Hidden Creek Lodge, a 2-story, 5-bedroom creekside rustic lodge completes the wedding venue with sleeping accommodations for up to 14 guests. 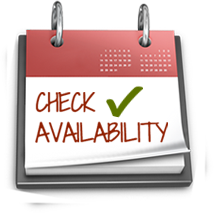 There is limited availability for 2019, be sure to book your wedding now! All pricing is based on 100 wedding guest count. 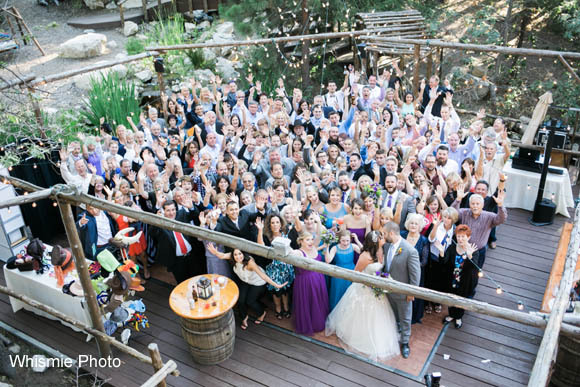 Wedding with less than 100 guests receives a credit. The maximum guest count is 175. *You are allowed to bring your own selected alcohol or add on one of our bar packages. There is no corkage fee! You and your guests will be served a gourmet dinner with your choice of two entrees, two sides, one salad, and an appetizer served on china with ivory or white tables linens and napkins. Your Pine Rose Designer Collection also includes a dedicated wedding coordinator, professional DJ, a non-alcoholic beverage bar, custom wedding cake, cupcakes, or pies and cake cutting service, an experienced bartender with wine barrel bar and cocktail tables, also all tables and chairs with accent tables for a flawless reception. Plus, you will get one night’s lodging at Hidden Creek Lodge for up to 14 guests. Schedule a tour to see for yourself, and discover the romance of nature. We are booking for 2019 dates fast, call today and inquire for your wedding day! Please email us at Events@PineRoseCabins.com for pricing and more information! You and your guests will enjoy a gourmet dinner with your choice of two appetizers, two entrees, two sides, one salad served on China with your choice of colored table linens. Your Pine Rose Perfect Collection also includes a dedicated wedding coordinator, professional DJ, a non-alcoholic beverage bar, custom wedding cake, cupcakes, or pies and cake cutting service, an experienced bartender with wine barrel bar and cocktail tables, also all tables and chairs with accent tables for a fun reception. The Perfect Collection also includes beautiful photography or videography, firepit for 2 hours, rustic lanterns for ambiance, bridal party bouquets, boutonnieres, and corsages. Plus, you will get one night’s lodging at Hidden Creek Lodge that accommodates up to 14 guests. All the pictures featured on this page are from a real Pine Rose Wedding! 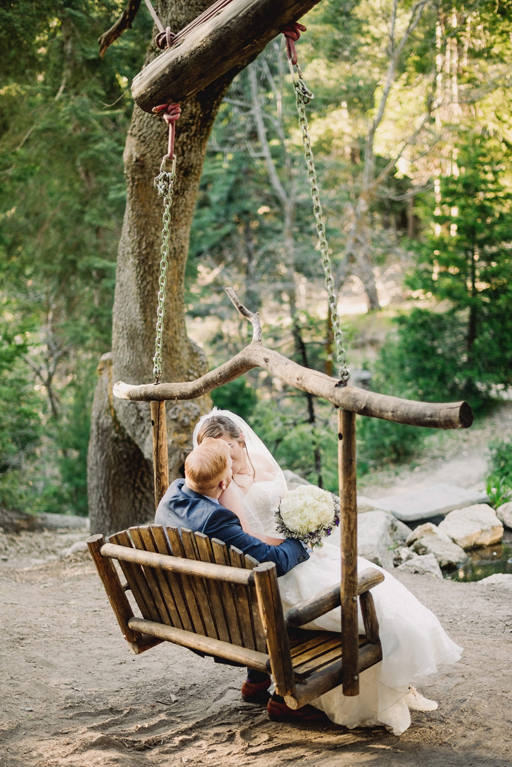 The Knot wrote a personalized blog for our weddings at Pine Rose Cabins! My son and New daughter were married this last weekend at Hidden Creek, Pine Rose Cabins. 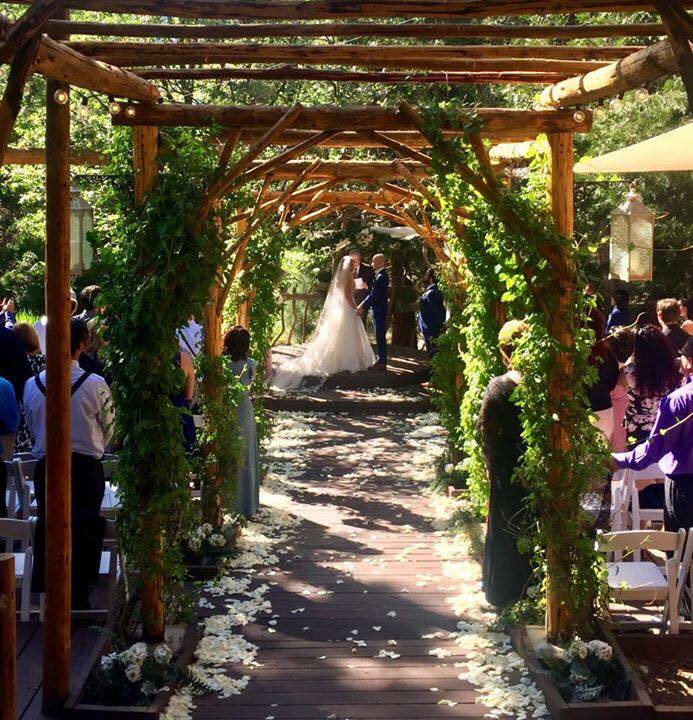 This is a spectacular wooded venue, truly beautiful with the perfect touch of elegance and casual. I cannot say enough about the amazing job Lynda our wedding coordinator did. Everything ran so smoothly, any problem was immediately taken care of, just a great job. John from Greystone Catering was also wonderful, the food really good and the cheese and fruit table for guests before dinner was perfect, as were the meatballs the passsed around, the servers so friendly and helpful. Nicki also did the most amazing job on our wedding Lord of the rings cake, phenomenal. We used Jasmine Rose for the flowers and just everything was beautiful. She listened so carefully to what we wanted accommodating every demand and even sending my new daughter pictures of each flower she'd be using in her bouquet. Pine Rose itself is a wonderful venue, but they do have a lot of weddings during the summer so time is limited for decorating and clean up. Noise restrictions also close the music down at 10pm on weekends 9:30pm weekdays and Sunday. You don't have to leave the venue fact the lodge is a lovely place for friends, family or bridal party to stay and celebrate afterwards they even have a lovely fire pit they can turn on for you. The vendors and beautiful venue make for a magically perfect day and we are so grateful to everyone for making that happen. can relax and connect with each other and nature. 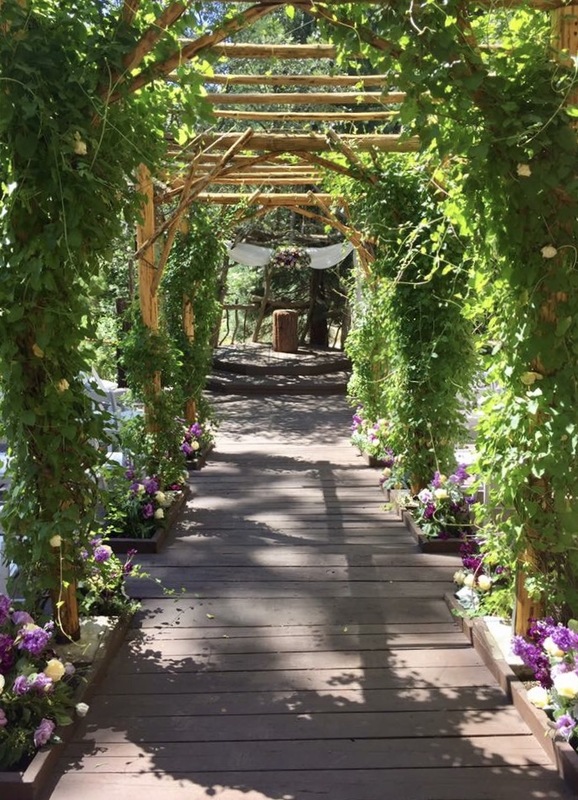 Plan your next business retreat, family reunion, yoga retreat, or church retreat in Lake Arrowhead. Contact Us Today!